Everything, Everything is now a major motion picture starring Amanda Stenberg from The Hunger Games and Love Simon’s Nick Robinson. A #1 New York Times Bestseller! ’Absolutely loved the book’ – Zoella Maddy is allergic to the world; stepping outside the sterile sanctuary of her home could kill her. But then Olly moves in next door. And just like that, Maddy realizes there’s more to life than just being alive. You only get one chance at first love. 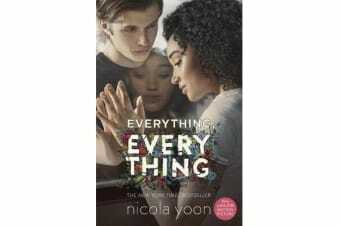 And Maddy is ready to risk everything, everything to see where it leads.‘Powerful, lovely, heart-wrenching, and so absorbing I devoured it in one sitting’ – Jennifer Niven, author of All the Bright PlacesAnd don’t miss Nicola Yoon’s #1 New York Times bestseller The Sun Is Also a Star, in which two teens are brought together just when the universe is sending them in opposite directions.